On September 21, 2011, the controversial execution of Georgia inmate Troy Davis, who spent twenty years on death row for a crime he most likely did not commit, revealed the complexity of death penalty trials, the flaws in America's justice system, and the rift between those who are for or against the death penalty. Unfortunately, due to sales rights restrictions, we cannot offer Grave Injustice for sale in your country. On September 21, 2011, the controversial execution of Georgia inmate Troy Davis, who spent twenty years on death row for a crime he most likely did not commit, revealed the complexity of death penalty trials, the flaws in America’s justice system, and the rift between those who are for or against the death penalty. Davis’s execution reignited a long-standing debate about whether the death penalty is an appropriate form of justice. 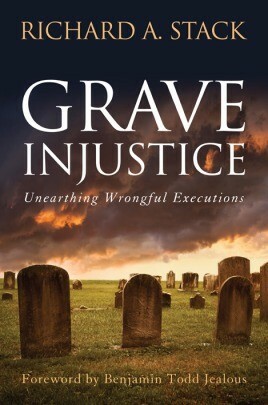 In Grave Injustice Richard A. Stack seeks to advance the anti–death penalty argument by examining the cases of individuals who, like Davis, have been executed but are likely innocent. By telling the stories of Jesse Tafero, Ruben Cantu, Carlos DeLuna, Cameron Todd Willingham, Larry Griffin, and others, Stack puts a human face on the ultimate and irrevocable tragedy of capital punishment.